Home » Blog » Chimney Maintenance » Gas And Oil Furnace Chimneys Need Inspections, Too! 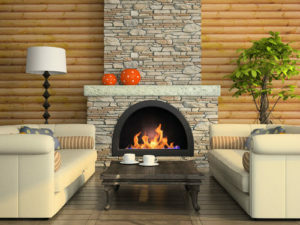 Gas and oil fireplaces and furnaces are popular heating choices for families looking for fast, convenient, cost-effective, and low maintenance ways to heat their home. However, even gas furnaces need regular servicing in order to burn safely and efficiently; gas and oil furnace chimneys require the same inspections as their wood-burning counterparts. Because of this, it is important to have these gas heating appliances inspected at least once per year. Gas heating appliances are extremely popular due in part to their ease of use and minimal maintenance. However, these appliances can still benefit from annual inspections. The Hearth, Patio, & Barbecue Association recommends that all gas appliances should be professionally inspected at least one time each year. While we rely heavily on our furnaces to keep our homes warm and comfortable during the winter, many of us pay them little attention beyond adjusting the thermostat. Because of this, unseen or unnoticed damage can occur, particularly in the venting system of the furnace’s chimney. An annual inspection can help discover any underlying issues; in gas appliances, shifting components by as little as a few millimeters can create gas leaks, so it is important to have these delicate tasks done by a chimney professional. Even fireplaces that seem to be working well may be suffering from unseen damage or problems. Gas fireplaces are particularly susceptible to having faulty or damaged valves or connections. Gas lines or gas logs that are shifted by as little as a few millimeters can create small gas leaks that can continue to worsen over time. An annual inspection by a certified professional is the best way to ensure the chimney of your gas or oil furnace. However, there are a number of things that homeowners can do to extend the longevity and safety of their heating appliances. First, all homes should have both carbon monoxide and smoke detectors on every level of the home. The alarm should be tested monthly and batteries should be replaced as needed. To ensure they meet current safety and detection standards, new alarms should be installed every 8-10 years. In addition to an annual inspection, there are a number of ways homeowners can ensure their gas and oil furnaces are operating safely all year long. First, conduct a visual inspection of the furnace at least once per year. The presence of soot on the exterior of the furnace could indicate that something other than oil or gas is burning. The furnace should also be regularly cleaned and dusted when not in use using a vacuum or damp cloth. Special care should be taken when cleaning the furnace to avoid moving, shifting, or damaging any furnace or chimney components. Our gas and oil furnaces keep our homes and our families warm and comfortable all winter long. This year, make sure your furnace is venting safely by having the chimney inspected. For more information on furnace chimney inspections or to schedule your gas furnace’s next inspection, contact the experts at Chimney TEK today!